Thunder center Steven Adams attempts a hook shot over Portland's Joel Freeland. Russell Westbrook makes a pass while guarded by Portland defenders. D.J. Augustin dribbles toward the basket during Monday's game. Thunder forward Enes Kanter battles for the ball with Portland's Tim Frazier. 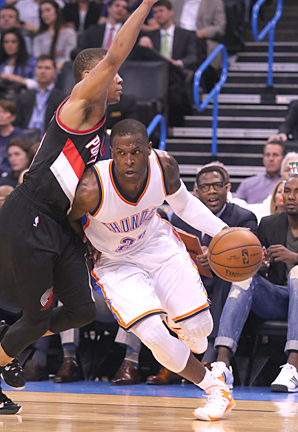 Dion Waiters makes his way through a trio of Portland defenders. Waiters had 13 points, seven rebounds and four assists. Enes Kanter, left, hands the ball to Andre Roberson who scored on an easy layup during first half action. Dion Waiters dribbles past a Portland defender during Monday's game. An 82-game NBA season has come down to one matchup for the Oklahoma City Thunder with a road game Wednesday at Minnesota. But first, the Thunder had to defeat the playoff-bound Portland Trail Blazers Monday and they did, 101-90, before another sellout crowd at Chesapeake Energy Arena. Oklahoma City remains tied with the New Orleans Pelicans for the eighth playoff spot in the Western Conference. The Pelicans defeated Minnesota 100-88 Monday night. Now, the scenario is simple. The Thunder (44-37) must win at Minnesota and the Pelicans must lose to San Antonio in the season finales if Oklahoma City is to advance to the playoffs. If both teams win, New Orleans would advance since it won the season series with the Thunder. If Oklahoma City squeezes into the Western Conference playoffs, it would mark one of the most dramatic turnarounds in NBA history. The Thunder started the season 3-12 after it was announced that last year’s league MVP Kevin Durant would not be in the lineup due to a foot injury. At one point, Durant and Russell Westbrook were out of the lineup with injuries, placing a greater burden on the rest of the team. Durant missed the first 16 games, played in nine games while averaging 22.4 points and missed another six games with a different injury. All total, Durant played in 27 games and averaged 25.4 points per outing. The injury bug also included center Steven Adams, shot-blocker extraordinaire Serge Ibaka, reliable veteran Nick Collison and defensive ace Andre Roberson. On Monday, Oklahoma City took care of business by playing a high-intensity first quarter while taking a commanding 35-21 lead. During that time, Thunder forward Enes Kanter scored 12 of his 27 points and grabbed seven rebounds of his game-high 13 rebounds. Portland won the second quarter, outscoring Oklahoma City 21-14 to cut the halftime deficit to 49-42. The Thunder maintained its lead the rest of the game although the Trail Blazers cut the advantage to five points early in the third quarter, but never got any closer. Each time Portland made a run, the Thunder responded with quick buckets to regain a double digit lead. As expected, Westbrook led the Thunder, which won for the second time in the last seven outings. Westbrook had 36 points, 11 rebounds, seven assists and two steals. He also turned the ball over five times. Westbrook’s offensive show came on the heels of a 54-point performance a night earlier, but it came during a losing effort to the Indiana Pacers, 116-104. Westbrook was whistled for his 16th technical during that game, but the call was rescinded Monday afternoon by the league office. It was the second time this season the league had rescinded a technical foul called against Westbrook. Players are allowed 16 technical fouls before serving a one-game suspension. Other Thunder players with double-digit scoring efforts were Dion Waiters with 13 and Anthony Morrow with 11. Oklahoma City had a huge rebounding advantage, 58-35, as Portland All-Star LaMarcus Aldridge sat out with a left foot sprain. Also missing from the lineup was Arron Afflalo (right shoulder sprain), Wesley Matthews (left Achilles’ tendon) and Dorell Wright (left hand fracture). GAME NOTES: Oklahoma City scored more points in the paint than Portland, 52-36, and tallied more second chance and fast break points…There were no lead changes and only one tie, 11-11…For the game, Oklahoma City shot 40 percent from the field compared to almost 46 percent for the Trail Blazers…Thunder center Steven Adams made four of 10 free throws, including two after he was deliberately fouled late in the fourth quarter. Prior to that, Adams had connected on two of eight.